There are a million recipes that call for eggs, but there’s only one tip you should remember when doing so. Let Filippo Berio tell you the secret to cooking with eggs — and getting it right, every time. 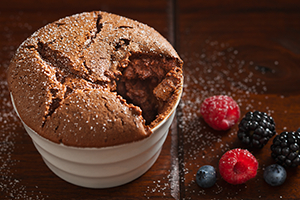 Few recipes use eggs as gloriously as this Dark Chocolate Soufflé from Filippo Berio. In general, it’s always better to work with eggs that are at room temperature. This way they will act like you want them to… in this case, you see the eggs separate much more easily.